Of the half-million for-hire shipping carriers in the United States, J.B. Hunt Transport is the fifth largest in annual mileage. Among the ranks of UPS, FedEx, Swift, and Schneider, J.B. Hunt has 14,354 vehicles in its fleet. According to the J.B. Hunt website, safety is a top priority. They only hire the best drivers, provide training programs to strengthen drivers' skills, and facilitate an overall culture of safety. That being said, with 15,671 drivers and 1.09 billion in annual mileage, some accidents are bound to happen. Since 2012, J.B. Hunt vehicles have been involved in 2,739 crashes. Of these accidents, 51 occurred in Maryland. In April and May of 2017 alone, 21 people have been injured in J.B. Hunt vehicle crashes. The large number of vehicles on the road isn't the only potential reason for J.B. Hunt tractor-trailer accidents. The company's employment reviews are mixed at best, with some drivers reporting falsified documents, poor pay, and ineffectual management. J.B. Hunt drivers typically make around $43,500 per year, well below the national salary average of $61,000. Logically, unhappy drivers are more likely to make mistakes which may result in accidents and injuries. The transportation industry is growing in the United States, with a projected shortage of nearly 50,000 drivers, according to the American Trucking Associations. With the high and growing demand for drivers, average trucker compensation has been increasing by an average of 8-12 percent per year. Though J.B. Hunt has committed to "hiring the industry's best drivers," it is not possible to retain suitable drivers and contractors when they aren't paying enough to attract the best candidates. In spite of these shocking statistics and bad reviews, J.B. Hunt is not necessarily a bad company. It has a "Satisfactory" federal safety rating, actively recruits veterans, and provides drivers with good benefits and annual safety awards. But trucking is a tough industry, with stressful work schedules and a shrinking workforce. 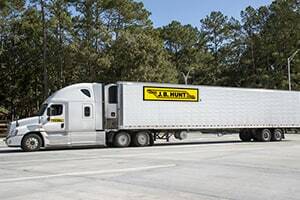 Despite J.B. Hunt's efforts to ensure safety on the road, if one of their drivers causes an injury or fatal accident, then J.B. Hunt is responsible for the resulting pain, harm, and loss. In most car and truck accident cases, the settlement value of the injuries sustained is at the heart of the conflict, rather than a liability dispute. In an ideal world, this would mean that the identity of the defendant is irrelevant. The jury would instead concentrate on determining the suitable amount of money necessary to help the victim become healthy and whole again. Unfortunately, the reality is that the defendant does make a difference. A jury is more likely to feel sympathetic toward an individual driver, rather than a large company with deep pockets. Therefore, the trial value of a personal injury claim is typically higher with J.B. Hunt, and a higher trial value leads to a greater settlement value. In addition, J.B. Hunt big rigs are much bigger and heavier than the average vehicle on the road, and as such they capable of causing more damage. Because J.B. Hunt claim adjusters are used to dealing with the larger dollar amounts involved in tractor-trailer accidents, this could be a contributing factor to the higher settlement value of claims against J.B. Hunt. What Else is Different About a Claim Against J.B. Hunt? A lawyer who specializes in car accident cases is not necessarily qualified to handle truck accident cases against J.B. Hunt. In tractor-trailer collisions, there are many tools that can be used to determine the cause of the accident which require a specific knowledge about tractor-trailer cases. Commercial transport vehicles carry modern electronic equipment that collects and stores information about the speed, airbag deployment, braking, and many other data points from the time of a crash. This data can help a jury decide whether or not J.B. Hunt was at fault for the crash. These tools, along with state and federal trucking regulations, offer a host of opportunities for helping victims of J.B. Hunt accidents, if you know where they are and how to use them. On our website, you can find a number of tools to help victims understand the potential settlement value for their claim. It is best to compare settlement values for types of injury, but it may also be helpful in some cases to look at the settlement values for different types of accidents. We provide statistics for the average trial or settlement value for many of these different variables. In very general and limited terms, looking at examples of settlements and verdicts involving J.B. Hunt may give you a sense of how the settlement value can change based on the jurisdiction, the severity of the injuries, and the economic loss caused by the injuries or death. 2015, California, $20,011,788 Verdict. The 47-year-old female plaintiff was legally entering an intersection when she was hit by a tractor-trailer driven by a J.B Hunt employee who had entered the intersection on a red light. The J.B. Hunt tractor-trailer hit the driver's side of the plaintiff's car, destroying the left side of her vehicle and pushing it through the intersection with such force that it left the roadway and slammed into a pole. The driver's door had to be removed by fire personnel to extract the plaintiff from the wreck. The J.B. Hunt driver fled the scene of the accident. The plaintiff was diagnosed with subarachnoid hemorrhage, concussion, and retrograde amnesia, and continued to suffer from serious cognitive impairments, chronic physical pain, depression, and other conditions as a result of her injuries. She has been unable to work since the accident, and was required to move in with her cousin who helps care for her financially and physically. 2015, Indiana, $32,500,000 Verdict. The 31-year-old female plaintiff was a passenger in a vehicle that struck an unlit J.B. Hunt semi-truck and trailer that had crashed into the median after losing control on a patch of ice. The J.B. Hunt truck driver had failed to follow state safety rules when he failed to turn on his truck and trailer flashers and failed to set out his reflective triangles as a warning of the existing accident scene. Due to the crash, the plaintiff suffered permanent brain damage and a month-long coma, resulting in her needing 24-hour care for her most basic needs, significant memory loss, and causing her to be wheelchair bound. The jury awarded the plaintiff $32,500,000 in damages and apportioned 30 percent fault to J.B. Hunt, 30 percent fault to the J.B. Hunt truck driver, and 40 percent fault to the plaintiff's driver. 2014, Illinois, $753,000 Verdict. A J.B. Hunt semi-truck crossed the center line while driving, colliding with the plaintiffs' vehicle. The plaintiffs, spouses, sued on behalf of their four children who sustained unspecified personal injuries. The jury awarded the plaintiffs with $550,000 and $128,000,000 for damages respectively, as well as $42,000, $11,000, $11,000, and $11,000 in damages on behalf of each of their four children. 2013, New York, $512,082 Verdict. An adult male pedestrian suffered injuries including a pelvic fracture, blunt trauma to the head, and fractured ribs, which resulted in his death, as a result of a collision with a J.B. Hunt tractor-trailer. The tractor-trailer, while turning right, struck the pedestrian as he was crossing the street in a crosswalk. 2013, Illinois, $1,600,000 Verdict. A woman struck the crash barrels located near the exit ramp of a highway, and her vehicle slid into a J.B. Hunt tractor-trailer's lane of travel. The J.B. Hunt tractor-trailer collided into the rear of the woman's vehicle, causing her death. The jury awarded the plaintiff $1,000,000 for past loss of society and $600,000 for future loss of society, and assessed liability at 40 percent to the plaintiff and 60 percent to the defendants. 2005, Tennessee, $1,510,000 Verdict. The three male plaintiffs suffered multiple injuries, including burns and required hospitalization, when their pickup truck was struck broadside by a J.B. Hunt tractor-trailer, and then struck from the rear by a Flannery & Sons tractor-trailer while they were stopped at a construction zone on an interstate highway. Liability was apportioned at 25 percent to J.B. Hunt and 75 percent to Flannery & Sons. The plaintiffs were awarded $1,510,000 for pain and suffering. Our law firm is based in Maryland. Most of the truck collision cases we handle are in the Baltimore-Washington area, but we handle significant injury cases throughout the entire country. If you have been harmed in an accident with a J.B. Hunt truck and want to consider a lawsuit or a claim for an out-of-court settlement, call one of our lawyers at 800-553-8082 or click here for a free no obligation Internet consultation.